As a $1.7 trillion market with $3.24 trillion in health care expenditures in 2015, the US health care market can be a pretty tempting target to companies, entrepreneurs and investors outside of health care. There’s a lot of opportunity (not to mention needs) in health care, yet the track record of non-health care companies (including startups with non-health care management) is poor – especially when it comes to big companies. Last week I came across an article that touched on the source of a lot of griping by health care outsiders, the increased level of regulations in health care compared to other big verticals. While it is true that health care has more regulation than many other industries, regulations are only the most obvious tip of the iceberg, with more substantive and subtle structural challenges lurking below. After the above tweet, this topic kept churning in the back of my mind. So, in an attempt at catharsis, I’ve tried to describe more of the iceberg that represents the structural challenges to entering and succeeding in health care. The structural peculiarities described below are especially important to products targeting interstitial solutions that span multiple enterprises, such as most connected health solutions. In addition to regulations, there are three additional ways that the health care market can stymie innovation. I’ve described those challenges and included some examples of how these characteristics impact business. Health care is a cottage industry with many independent entities contributing to an episode of care. Health care is a cottage industry made up of numerous separate enterprises that work together to deliver health care services to a community. These “cottages” are trading partners amongst themselves and health care providers to patients. No health care market is completely vertically integrated except for some nationalized health care systems. Categories of trading partners can be very different in how they deliver care, how they’re paid and who pays them. Coordinating care across trading partners has traditionally been done using phone calls and fax machines. Can one solution meet the needs of this entire collection of trading partners? Perhaps, in some cases and certainly not easily. It comes down to this: there’s only so far a patient will travel to receive health care. And most people won’t drive very far. (The diagram atop this post depicts six health care communities with the blue circle defining the community’s size based on maximum travel distance.) This means that health care trading partners are organized within the travel distance of a group of patients that is smaller in urban areas and larger in rural ones. Trading partners are only interested in the patients and other peer trading partners within their community. Payors, i.e.,health care insurance companies, are the big exception to this as they sell the same products across multiple communities on a state-wide basis. The community nature of health care has a significant impact on adoption strategies due to the need to quickly achieve a minimum level of adoption among target users – patients and/or trading partners – to be able to produce value for customers. For example, providers are only interested in interacting with other physicians and trading partners in their community. Trading partners in the network who are across town or across the state are of no consequence. Health care is a B2C market. In mostB2C markets, the person who selects and buys a product or service is the same person who uses and pays for the product – not in most health care markets. Health care also has multiple personas, rather than a single consumer, that can control one or more of the process steps (select, buy, use and pay) required to make a basic health care transaction. These personas are the patient, health care provider and payor. Each process step can be quite different; each step has its own requirements, process or procedures and type of value sought by the persona. When these process steps are controlled or completed by a single consumer, the seller only has to deal with a single set of four requirements, process or procedures and desired value proposition, one for each process step. 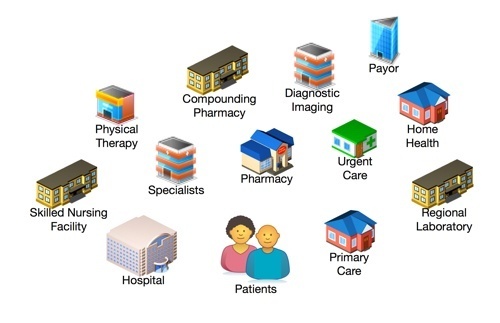 In healthcare you can have as many as 12 sets of variables (four process steps by 3 personas). A similar increase in scope is found in the business model where the vendor side of health care transactions includes marketing, sales, installation, training, implement and support through to an ongoing relationship. Almost every aspect of health care delivery is regulated. The creation, manufacturer, sale and use of drugs, diagnostic tests and medical devices are all regulated by the Food and Drug Administration. The legal definition of a medical device is remarkably inclusive; companies and their senior management ignore the FDA at their peril. But regulation doesn’t end here, it’s just beginning. Specific kinds of tests, treatments and care are effectively regulated by the Centers for Medicare and Medicaid Services (CMS) and private payors as a consequence of reimbursement policy. In many situations, innovative products must gain formal reimbursement approval by CMS and other payors before payors will agree to pay for them. This reimbursement approval results in the creation of a procedure code that providers or patients then use to bill payors and eventually receive reimbursement. Payors have extended their informal regulating power by stipulating situations where they will not reimburse providers. When certain preventable adverse events occur, payors will not reimburse providers for the additional costs incurred. Patient outcomes that are deemed subpar by payors, such as hospital readmissions within a certain timeframe after discharge, receive a reduced level of reimbursement. Payors continue to extend their informal regulatory power, with the latest example being patient satisfaction. Hospitals that receive low patient satisfaction scores on HCAHPS surveys also receive reduced reimbursement. Providers are regulated by professional associations such as county-based medical societies that validate provider’s credentials and impose a degree of oversight through bylaws. Hospitals are also accredited by national and international accreditation bodies like the Joint Commission. Providers who lose their accreditation lose the authority to practice medicine and/or receive any kind of reimbursement from payors. There are many health care related industry standards. While many are voluntary (and some of those are actually adopted) the acceptance and use of many industry standards is imposed by accreditation bodies who check compliance during accreditation inspections. The plaintiffs’ bar is another entity indirectly regulating health care. Over time, the outcome of trials influences the behavior of the industry. Another form of slow moving external constraints (or opportunities), is rent seeking. A strong influence in health care for decades, rent seeking increased in influence with the advent of the Affordable Care Act in 2010. The MEDTECH Act of 2016 is one of the latest examples. Now let’s look at some examples of how these four structural barriers to success in health care impact business and the delivery of health care. Chronic disease management and patient self-diagnosis are examples of market segments where there is some ambiguity around who selects a solution and who buys it. You may have the option to target either the patient and/or provider for one or both of these process steps. This example of market dislocation necessitates extra thought and effort to craft an adoption plan (or perhaps more than one adoption plan) that drives the most rapid growth with the lowest cost and churn. Mapping out a plan for each persona at each step in the process chain is critical to crafting realistic milestones, and meeting those milestones. We’re all familiar with the network effect and the conventional examples of fax machines and telephones. Health care can have a similar network effect, except more complex. Driving adoption among different health care trading partners and their patients can be tough.The cottage industry nature of health care is what gives rise to a network effect. Early on, there are few users so the value proposition for trading partners and/or patients can be quite limited. First you want to drive adoption to make your solution more compelling to new adopters. Later the goal is to reach a level of adoption where the value is so compelling that the effort required to drive adoption is reduced, almost self sustaining. The geographically limited community nature of health care also becomes a factor. Say you want to automate the transactions that occur between providers, hospitals and payors. You have limited time and funds with which to realize meaningful adoption and become cashflow positive. Let’s say that with considerable effort you can drive adoption among 1,000 users (providers and hospitals) per month. Do you want to do this nation-wide, state-wide, regionally, or in a single metro area like Houston? A tighter geographical focus results in a higher density of users and a greater network effect in less time and effort. Some secure messaging solution providers have shrewdly played the network effect, partnering with county medical societies and driving adoption among all the physicians in a metro area. Other secure messaging providers target hospitals as aggregators of potential users, while others don’t seem to account for the network effect at all. In health care, the network effect is a harsh mistress. At this point there are no rules of thumb to forecast how or whether a network effect will impact an adoption rate or the effort and costs required to drive adoption. The value proposition for any given solution is often different for each different persona involved in the use of that solution. And because the trading partners are for the most part independent, each persona must have a compelling reason to adopt. In practice, evenly spreading the effort and benefits of a solution evenly across all the users is often hard to achieve. Those trading partners who get most of the work and few or none of the benefits are going to be a challenge. As seen in the section above on regulations, payors add a considerable bit of complexity to being in the health care business. One could argue payors and reimbursement represent a fifth way that health care is different from other markets. For this post we’re going to pretend that payor and reimbursement issues are an example of industry regulation. The challenge with payors and reimbursement is the need to first determine which persona is going to actually pay for a startup’s cool new technology. Among the three personas, payors have the most money but they are also the stingiest. New technology must be thoroughly vetted before payors will pay. And the process, as described above, is not trivial or inexpensive for the company that wants a new charge code and reimbursement for their cool tech. With many products there is no one best answer for who pays and the company bringing the solution to market can pursue one or more personas for payment. When the payor is the logical persona to pay, or the payor will result in broader or more rapid adoption, then one must bite the bullet and work to get reimbursement. Every industry has its quirks, health care is just quirkier than most. Keep in mind that of the four ways health care is different along with the examples, all or most of them can apply to any given product or solution. Working through all these issues is often an iterative process that is refined and optimized — and sometimes completely reworked — as experience in the market place is gained.